Metallica are returning to Australia in 2013. 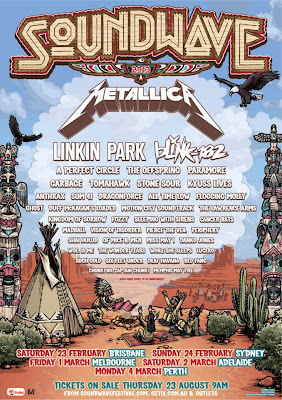 The band have announced that they’ll be headlining Australia’s Soundwave festival in February and March of 2013. Joining the metal icons on the bill are Linkin Park, Blink-182, A Perfect Circle, The Offspring and many more. Specific venues will be announced at a later time. Register to be a Soundwave Festival member at www.soundwavefestival.com. Tickets for all cities go on sale on Thursday August 23 at 9:00 am local time at www.soundwavefestival.com. The festival is trying to rebound from its cancellation last year, when Van Halen were scheduled to headline the traveling event; reports suggested a second headliner pulled out about a month before the tour was to start last September, causing the organizers to shut it down.. The festival did not operate in 2012.